Compost for you: Moving from right to left, you can see how microbes deconstruct organic garbage into compost.Courtesy ThorThat's right. There is something rotten, smelly, nasty happening right in the lobby of the Science Museum of Minnesota. We've got compost on display. 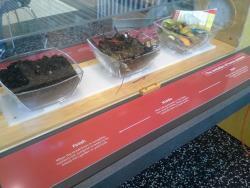 You can see the three phases of compost from fresh organic garbage to midway decomposed waste to finished compost. And you can learn all about the science that makes it possible to turn trash into ground-enriching treasure. Here's the link to the web content that accompanies this exhibit. Oh, and don't worry about the smell. The case the compost is presented in has special filters to keep any nastiness from getting out! It couldn't possibly smell worse than that dang chicken we mummified. good composting techniques would keep compost from stinking....but that's hard to do in an enclosed case!